Dampen the Dakos rusk in some water, then put on a plate and grate tomato and feta cheese or mizithra cheese on top of it. Springle with Cretan oregano and add extra virgin olive oil at will. If you are an olive fan add some chopped olives on the Dakos. 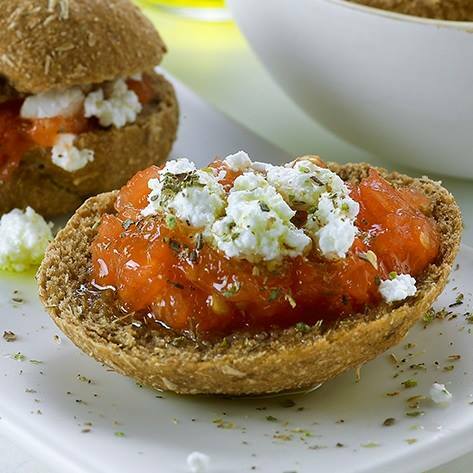 The famous Dakos is a very common side dish from the island of Crete made with Cretan rusks, tomatoes and olive oil. It can be garnished with grated feta cheese or mizithra (fresh, soft goat cheese) and add some caper, oregano or olives. Cretan Dakos can be made either with round Dakos rusks or plain Cretan rusks. If you want to serve Dakos for many people you can make small Dakos with mini rusk bites.